Elfers is an incorporated part of western Pasco County located along US 19 and State Road 54 between Holiday and New Port Richey. It's history goes back to the early 1900s when it had a railroad station, a post office and citrus farms. It was even incorporated briefly from 1925 to 1923. Today Elfers is a part of the Tampa Bay metropolis. It's a short drive from downtown Tampa and bay area beaches. Are you looking for an Elfers swimming pool builder to create a beautiful Elfers outdoor living space for you and your family? Consider Grand Vista Pools. We have been building new swimming pools in Elfers, Florida and the surrounding Tampa Bay area for more than 20 years, and we would love to design and build your pool. One benefit of choosing Grand Vista Pools is we are a licensed general contractor in addition to an experienced pool builder. Therefore, we can design and build your entire outdoor living area including renovations to your home to make your indoor living space and new outdoor living space flow together perfectly. Elfers has some well-established neighborhoods with older homes whose pools may be in need resurfacing or remodeling. If it's time to resurface your Elfers pool or you want to renovate your pool to better fit your family's lifestyle, Grand Vista Pools can do this for you. Want to add a spa? Lighting, water or fire features? No problem - we can do it all. 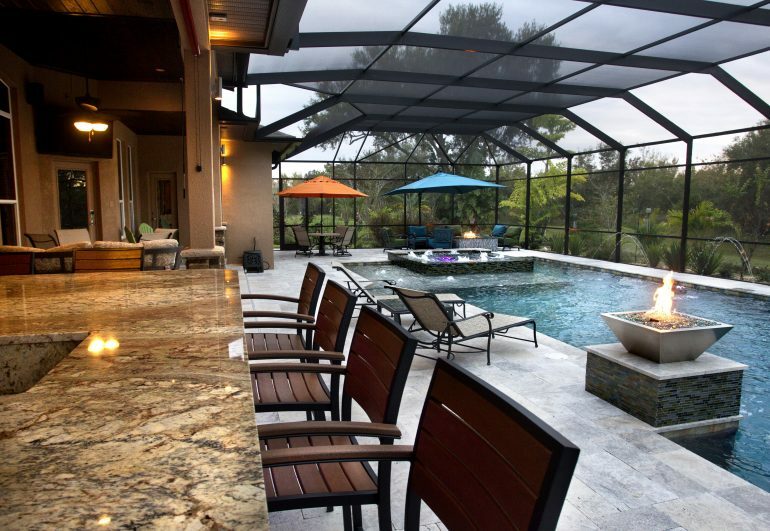 Grand Vista Pools is also a leading designer and builder of Elfers outdoor kitchens. Want to add a beautiful full-featured kitchen? Or maybe a fun outdoor bar with TV to hangout with friends? How about a manly outdoor grill? We can create the perfect outdoor living space for you.